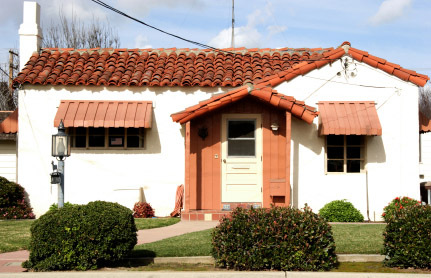 When I say "very small houses" I’m usually talking about 500 square feet or less. But there are always exceptions like a husband, wife and three kids in a 700 square foot home. I enjoy looking at all kinds of tiny houses so I’ve collected lots of photos and I like to share them on this website. And speaking of different types of homes, there really are a lot! 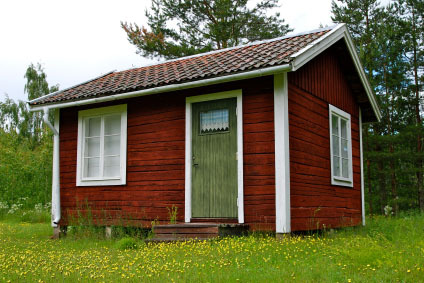 These days here’s what comes to mind… any type of older small homes, tiny houses built on trailers and shed houses. Then there’s modern prefab and many other interesting miniature designs. What a beautiful little Spanish style cottage that this is. I love the red shingles on the roof and the window covers that help keep the sun out. It looks right around 500 square feet. This is perfect for a couple and if it’s a two bedroom it can also work for a young family. The photo was taken in California by photographer James Pauls. This is about as simple as it gets isn’t it? This tiny red cottage looks like it’s about 150 to 275 square feet, maybe even less. Just enough room for the essentials and no more. If it were mine I’d have a sleeping loft upstairs and the living, dining, cooking and bathing downstairs. It’s good enough for just one person to live or it could make for an awesome get away in the backyard. You can use a simple structure like this as an artist retreat, meditation room, office or hobby room. 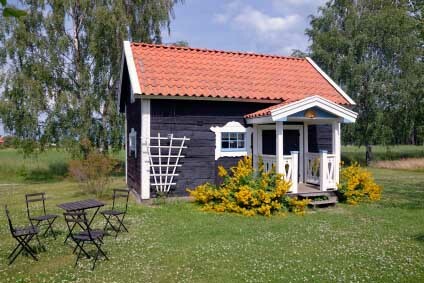 This little cottage was photographed in Sweden by Kristoffer Hamilton. You’ll immediately notice that what this house lacks in size it has in beauty. Great choices of color in the paint and I always love the red roof shingles. This photo was also taken in Sweden but by another photographer, Johan Möllerberg. If you’re interested in building your own very small house, there are lots of resources available throughout this website. There are many other very small houses I talk about throughout this website, go and take a look at these interesting mini homes built on trailers. You also might enjoy my write up on Tiny Texas Houses, a pioneer in recycled home building. If you just want some simple and inexpensive plans to get started on a basic structure, you should take a look at Michael Janzen's Tiny House Plans. Link opens in a new window.